Having lived on the lower west side of Manhattan for a large part of my adult life, I've been lucky to witness - occasionally with shock, but mostly with wonder - the changing landscape of the area. From my early days in the Meatpacking District (when I had to jump puddles containing a variety of liquids on my morning commute), to being part of the steady explosion of West Chelsea, I can't help but notice the shifts and changes of industry, architecture, and general foot traffic. 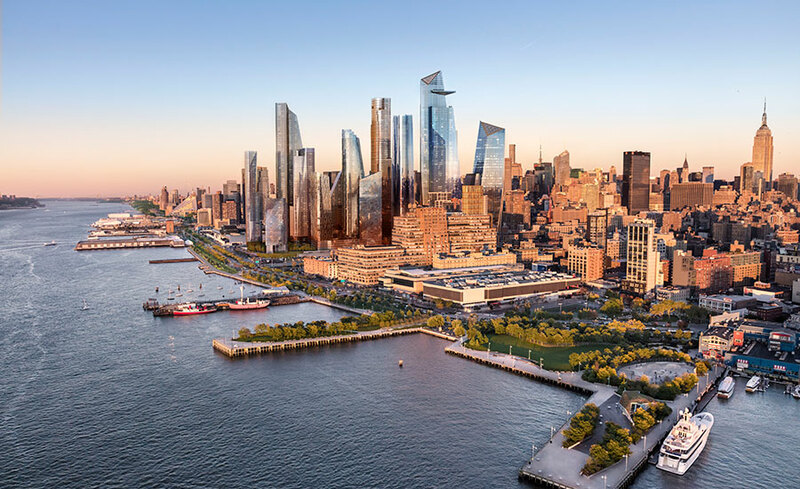 The development of Hudson Yards — first as a barren landscape, then proposal and rendering — is now on my hot list of places to observe. A few years ago my husband and I had an opportunity to explore the not-yet-developed northern branch of the High Line. This allowed us to walk directly over and next to the Hudson Rail Yards, then home to what appeared to be a few acres of rail cars. Were they in use or storage? We couldn't tell. Fast forward to this fall, walking along the same route — now open and expanded — at sunset, we were met with views of some of the real-life, occupied elements of Hudson Yards. There are many pros and cons to all these developments in NYC (Meatpacking, West Chelsea, Hudson Yards, etc.) related to shifting economics and affordability, traffic and congestion. What I can't help appreciating, though, is the experience of walking through and near someone's creative project. Yes, the developments were designed as economic engines, but part of what drives some of those engines is a thoughtful desire to plan and design a destination that people will use, see, and walk past. And (when not stuck in construction-related traffic), I consider myself lucky to witness the process and finished projects. Here are a few images illustrating the development of Hudson Yards. Enjoy. Visitors to the northern portion of the High Line next to Hudson Yards, prior to its public opening, in 2013, via NYTimes. 10 Hudson Yards, opened in 2016, one of the first completed buildings, surrounded by the ongoing construction, via NYTimes. A view of the new Coach headquarters lobby at 10 Hudson Yards, from 6sqft. A rendering of the Shed, a six story space for art performance and installations via CurbedNY. Rendering for the interior of "The Vessel", a proposed centerpiece structure for the public plaza, via Fortune. A view of Hudson Boulevard, one of the new green spaces in the area, from CurbedNY. A future proposed view of the west side, via iflarchitecture.